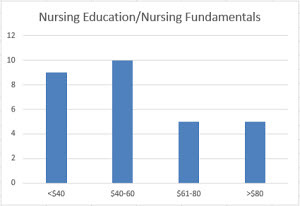 Over the past year, we have received a total of 29 titles in Nursing Education and Nursing Fundamentals from nine different publishers, with almost half (14) from Springer Publishing and Wolters Kluwer. So far, we have published reviews of 16 of them. Prices of these books range from $30.99 to $165.00, for an average price of $61.76. Doody’s Core Titles 2018 features 16 titles in Nursing Education, with all but one of them designated Essential Purchase Titles! Nursing Fundamentals has 17 titles on DCT 2018, with six designated as Essential Purchase Titles.